I’ve previously shared a couple fake agaves I’ve ran across. First a pair I spied on the ANLD tour last summer and then the damaged ones I discovered at Pier One. I suppose I shouldn’t be shocked when I see them anymore; there obviously is a market for fake succulents. 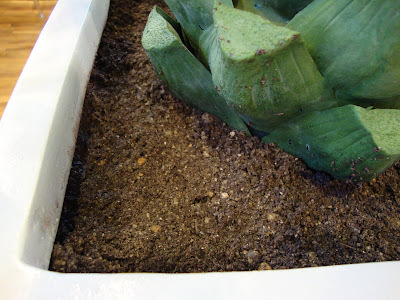 In fact when Megan of Nestmaker recently posted about a fake succulent garden I actually confessed to liking it. And I wasn’t lying. I guess what really surprised me about the one I saw last weekend at Z Gallerie was the price, $179.95, why would anyone pay that for a fake plant? Yes I know it will live forever and the people who buy these things probably aren’t really gardeners but geez! This one even had the stubs from the imaginary removed leaves around the base (that’s fake soil, a solid mass of something) And the pressed patterns that the unfolding leaves make on each other. Of course they also have plastic injection mold holes too (no I don’t know that is what they really are called, I am just guessing). I got into my car this morning and realized yesterday when I claimed I would never cut agaves leaves to put in a vase I forgot about this one. Now granted the leaves aren’t cut, this little agave pup is planted (with actual soil) in the bud vase of my VW Beetle (yes it’s true, the new Bugs do come with a bud vase). The beauty of this arrangement is in the summertime when cut flowers would wilt from the sun and heat this little agave will be loving life! But I did have to bring him into the house on our really cold nights this winter. I suppose it’s the true sign of an agave fanatic when you even have one planted in your car huh? Only you, Loree. Only you would put an agave pup in your car. I love it! The plastic one, not so much. Nice plant for your Blumenvasen. 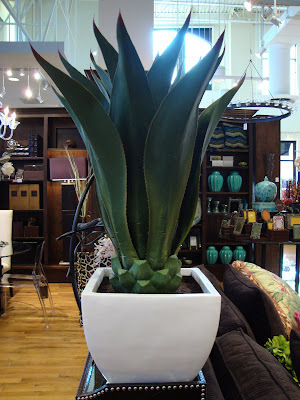 I saw fake agaves just like that pictured in a mall in Trinidad-what a hoot esp the "cut off leaves". I guess they wanted an agave look without the danger of sticking the patrons. 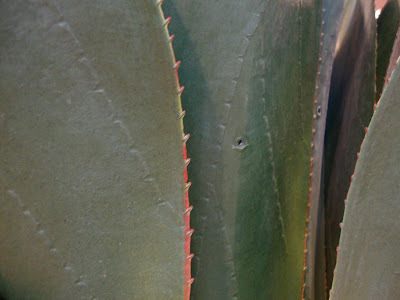 Yes, the true sign of an agave fanatic :)... and I dislike plastic plants too. Hahahaha! I love the agave in your car! OMG!!! I love the agave in the car :) The faux agave isn't terrible, if fake plants are your thing. I've seen way worse. OH yeah, you're a true fanatic now! How great for VW to include a bud vase? And is it REALLY or are you just using it a such??? Okay, I think I solved the hole issue, "plastic injection mold holes". They are actually the entry point of some sort of weevil...maybe a snout nosed weevil. well said Bangchik, "a gesture of treasuring beauty in your own hand and it stays there forever" you almost make a fake plant sound beautiful! Nicole, ok so the no injury aspect is important, but they could have just snipped the tips off right!? Evelyn, I accept that label. Megan, true...there are worse. For that price though it better be good! Megan, I have a new goal...Bug full of agaves! K&V, it really seriously is a bud vase! Of course it came with a plastic one. I had to upgrade to the polished aluminum version to satisfy my lust for all things shiny and silver. The agave in the car vase is just so you ! And a bit of trivia, the name of the injection hole is usually called an orifice. For two years I designed high frequency injection molds and machinery for the foot ware industry ( Converse, Bass, Frye, ....) and the name of the injection hole was orifice followed by the diameter in thousands of inches .125 = 1/8 of an inch. I might be tempted to buy a fake agave, having lost a boat load this winter, but never one cut like this. I am noticing a number of agaves like this around our neighborhood. I just don't like them when the lower leaves are cut. However, I wish that was all that was wrong with mine. The centers are toast. As to the agave in a vase- I'm jealous, i wish I had one in my car. Yes, I believe we can safely say that you are an agave fanatic. I wonder if you're the only one out there with an agave in your bud vase--truly original. My oh my - I love the way you think! 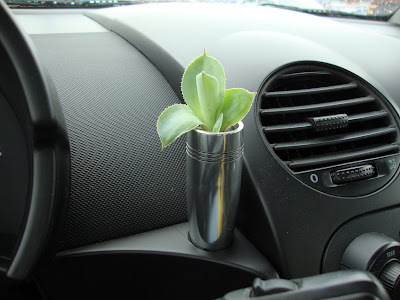 I want to have plants in my car! The calendar says winter, the heart says spring!